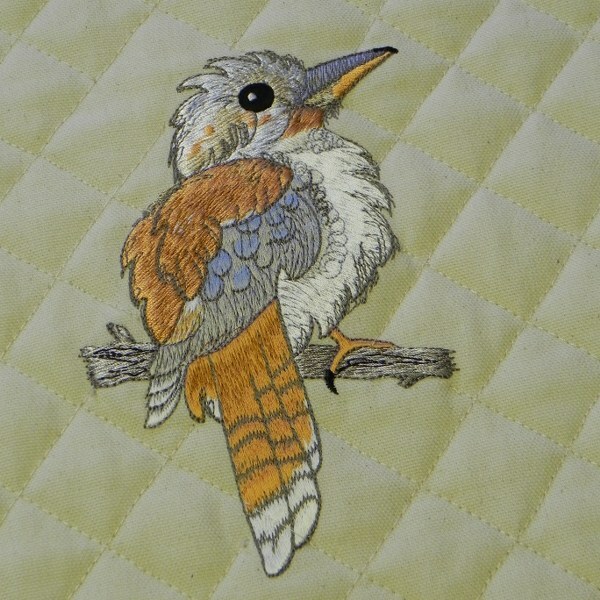 When I’m not appliqueing or quilting I can usually be found doing a bit of machine embroidery. I like something to make me laugh so I tend to go for quirky, humorous but always well digitised embroideries. 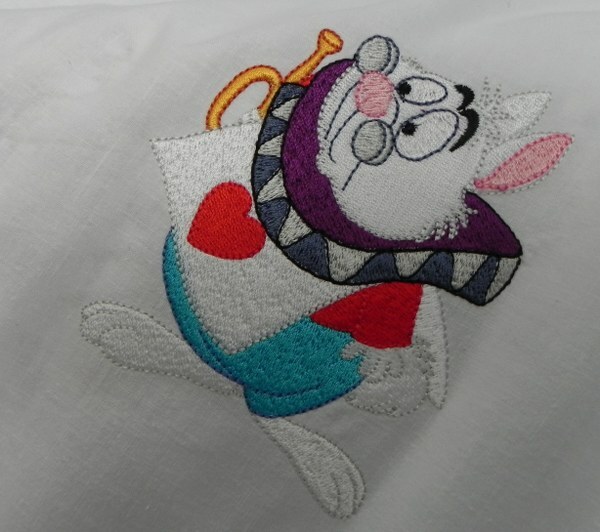 There is nothing worse than investing in an embroidery pattern and spending time and effort embroidering it to find that the stitches don’t look good or the outline stitches are not where they should be. This is especially irritating when the design has been bought for a special reason. 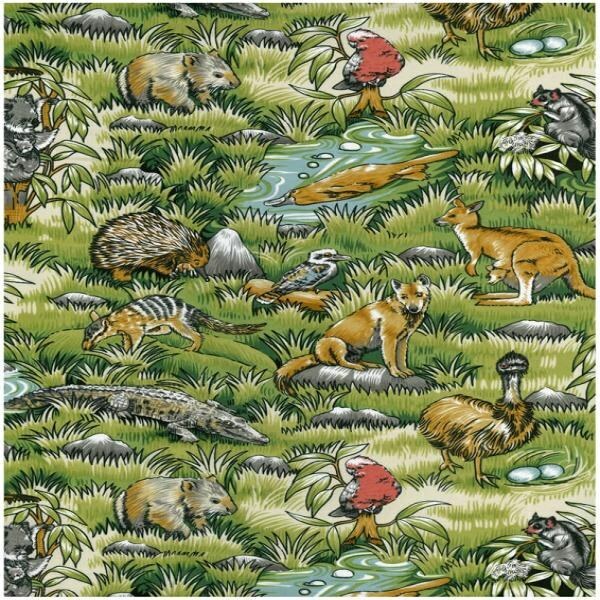 The designs that started me off were from Loralie Designs in America but one of my favourites actually has an australian theme. 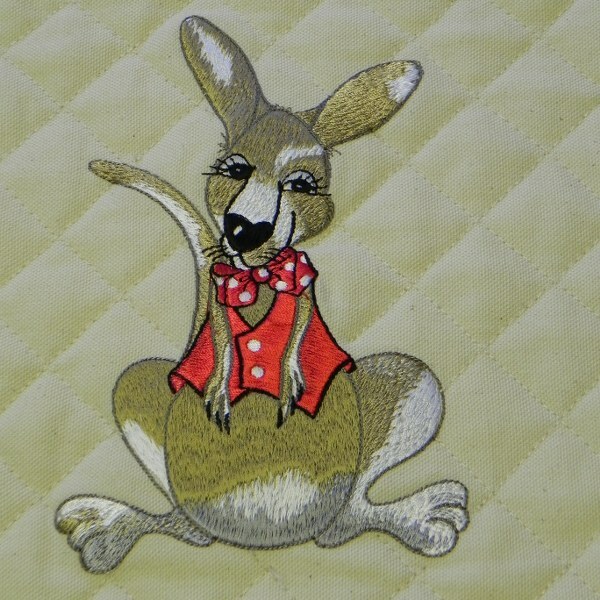 I am not sure why I am attracted to australian designs in quilting and now embroidery but I suspect it is because they are great fun. When you work in a dungeon every little ray of sunshine helps. 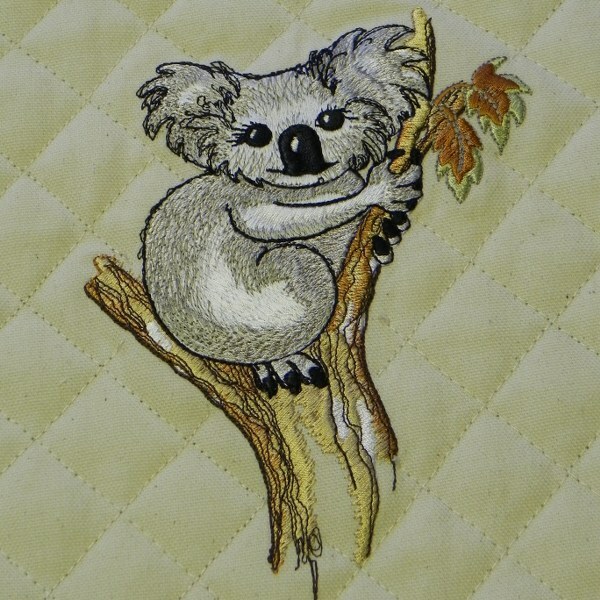 I found some australian fabric and made up a simple design as the embroideries are all the character it needs. I also did a bit of simple diagonal quilting to make the background more substantial. For a bit more dimension I sometimes embroider with the wadding already in place. It depends on the effect I want to get. The only tip I can give you for this type of quilt is accurate measurement. I have found over the years that my seams have become automatically more even and so my measurements are usually what they are supposed to be. I still always measure, not just the piece I am working with but also any other piece that should be the same length. If opposite borders are different lengths then it is no good cutting pieces the two different measurements. As you can see this will mean your top will not be square. 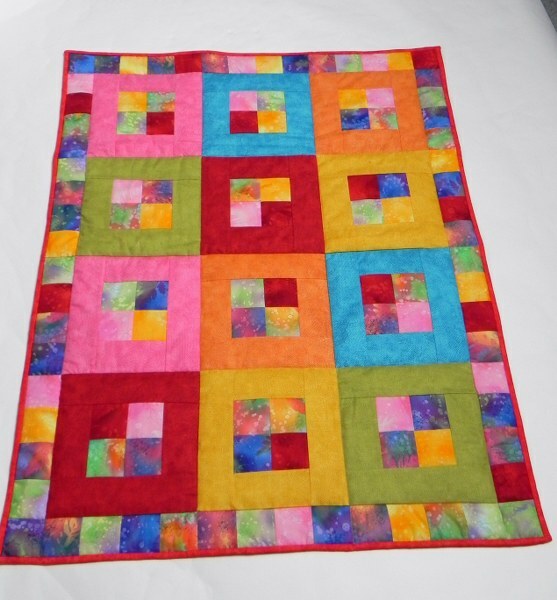 If you measure at each stage, if there is a discrepancy you can put it right when it has happened other than when it would mean unpicking several stages.If your top is not square your finishing and quilting will be a nightmare. Do not ever be tempted to take a long piece of border and just stitch it to the quilt top without measuring and cutting first. If you do this, a perfectly square top could end up distorted. You need to keep complete control of the strips.I think this is why I have never tried mitred corners on my binding. I cannot see how to keep the symmetry of the quilt and all my carefully measured edges if I use an unmeasured piece. It is not helped by the number of quilts in magazine pictures that seem to have wonky edges. I am open to conversion if you have found otherwise. Let me know and tell me the secret. I also find that any project on which I have had to fudge something whatever the reason and whatever the project becomes a bit of a bugbear, nagging me every time I see it. So even if you manage to fix it so that it looks fine, you will always know. The more you progress the more this will be the case and the more careful you will be. Why not cut out this stage and start as you mean to go on. 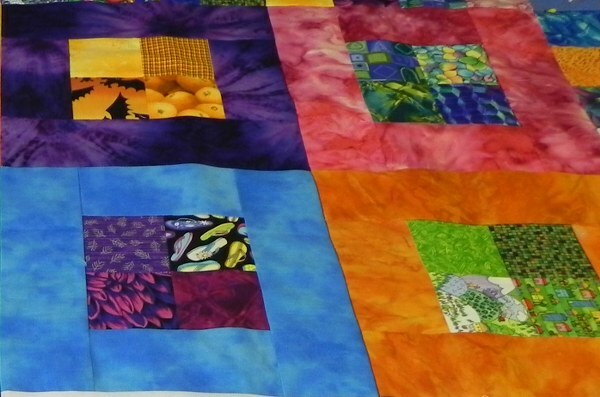 There are a lot of straight lines and corners in quilting. Measure, measure, measure and you won’t go far wrong. I have finished the last dragon in my dragonathon. They are all now ready to be incorporated into the quilt. When planning an applique one little trick that I find pays off is to cut the background pieces slightly bigger than they need to be when finished. 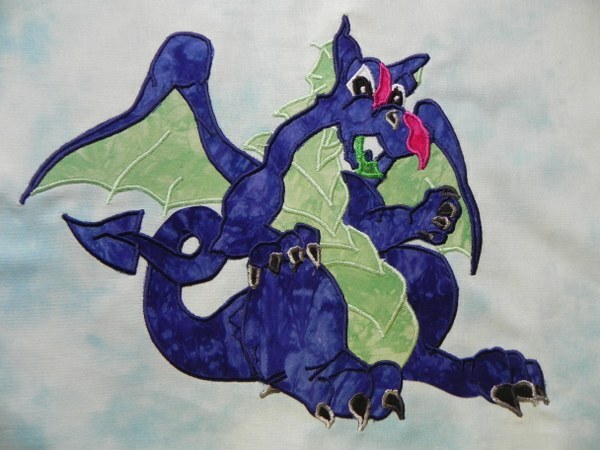 When an applique is stitched the background fabric sometimes becomes distorted. How badly will depend on various factors including how good your applique technique is and how tight the stitches are. If you allow even an extra 1″ around it means that you can trim it to straighten up the block. I usually allow about two inches extra – that is if the piece needs to be 10″ x 10″ I cut it 12″ x 12″. This will obviously be dictated to a certain extent by the amount of fabric available. 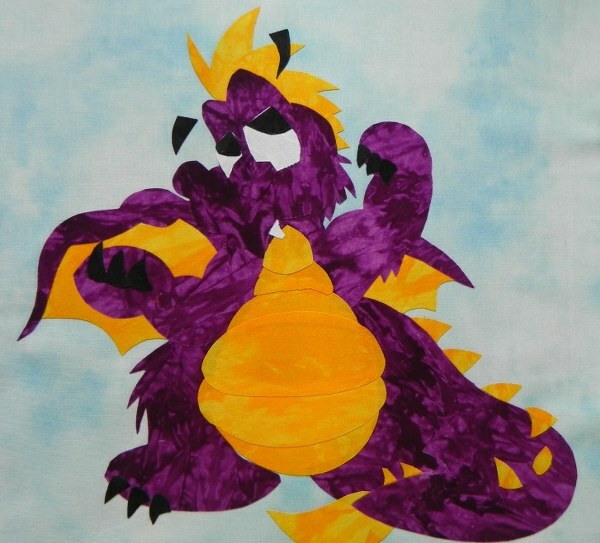 When I have done the applique I then cut it down using my cutting board and rotary cutter. I don’t necessarily cut 1″ off each side. I look at the finished picture and decide if I need to take more off one side than the other. Cut one side then use that now straightened side placed along one of the cutting mat lines to cut the other side. Then use these two straight sides against cutting lines to square up the other two sides. Trimming with rotary cutter and ruler. Trimmed to provide nice straight edges. 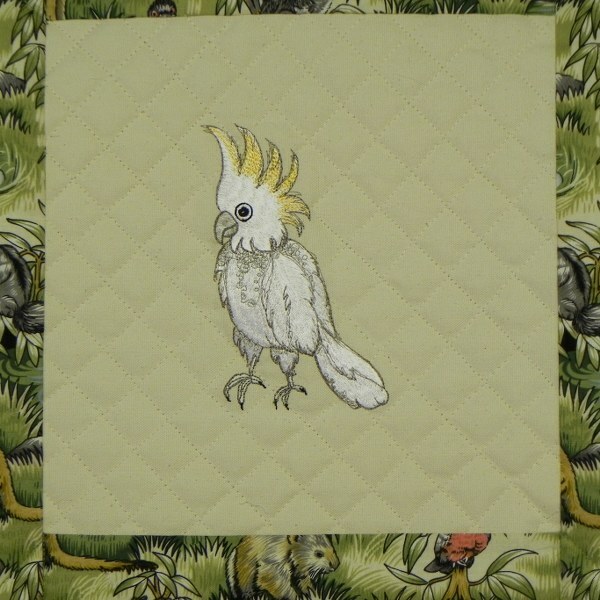 You will now have a beautifully squared up block to help you achieve a beautifully squared up quilt. This means that when you come to add wadding and backing and quilt it you will not be struggling with an uneven quilt top. This means your will to live will be preserved for longer. Having achieved a straight edge ready for a perfect quilt cut each piece as you need it, checking all measurements before cutting. Never blindly follow measurements given to you in a pattern. The pattern designer may have worked out what the measurements should be but they have calculated without knowing how accurate your seams are. I use an overlocker to sew my seams so they are not always a perfect 1/4″. This does not matter as long as I make all my seams the same and measure every piece accurately before cutting. If you have to start stretching seams to fit your quilt top is going to be warped and you will be an unhappy quilter. 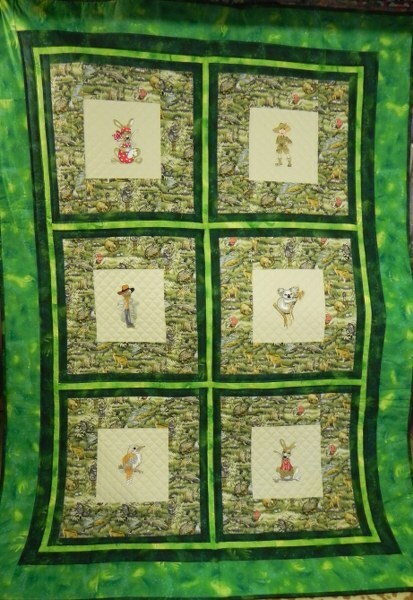 The point of my telling you these little tips is so that you are a happy quilter. Ergo, I will also be unhappy as I will have failed. So to keep us all happy and chirruping along MEASURE TWICE AND CUT ONCE. If you look at the finished quilt top you will see that the next stage is the sashing. 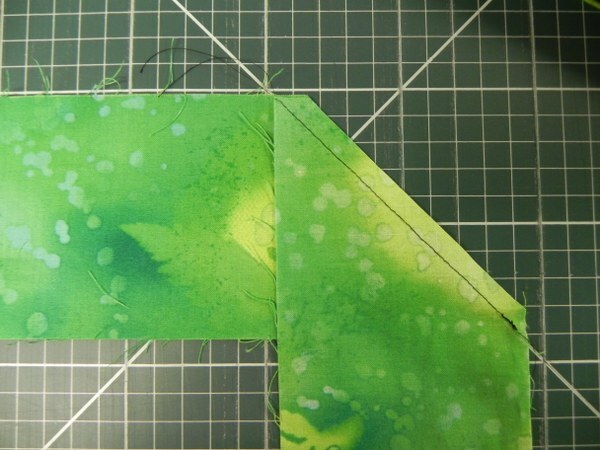 This is the narrow strip of fabric between the blocks, shown here in green. Look carefully at the quilt top and you will see that you can work out which order to do the sashing in. 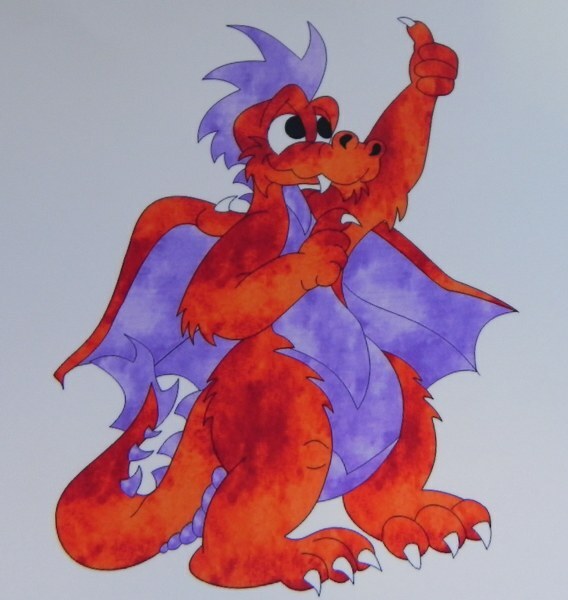 The orange and purple dragons on the left have one strip between them. The middle dragons have a strip between them. Join these two pairs and then cut a strip to join them together into the block of four. 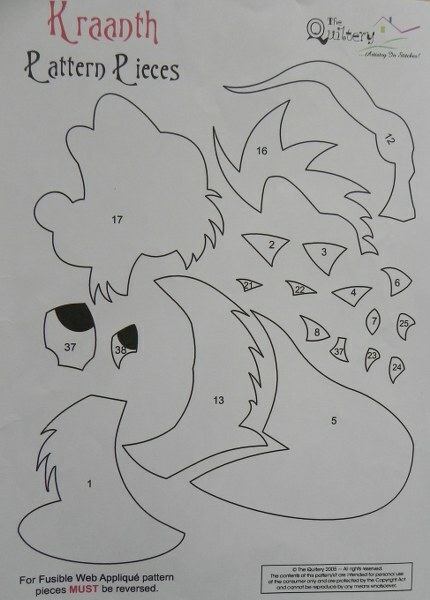 The two dragons at the top left should then be joined and then that strip joined to the bottom four.That then just leaves the three on the right to join together and then join to the six block. You need to be able to work out how to do this as sometimes patterns are not clear. You may think you know what it means but it is only when you have cut your precious fabric that you realise you didn’t fully understand. If you take some time to understand the finished top you will be able to check at each point. Next the borders. 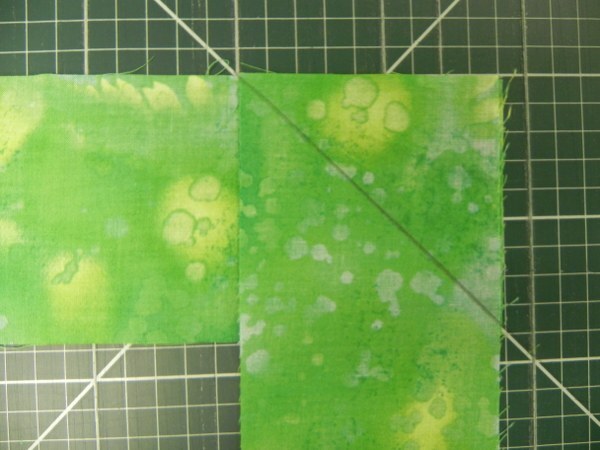 Often the fabric width is not enough to stretch the whole side of a border. One little trick to make it look as if you did it on purpose rather than just joining two bits of fabric is to put a contrast fabric on the join. This is how it would look. 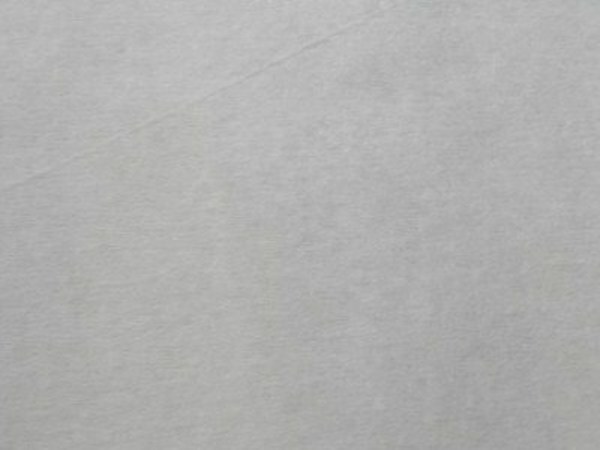 You may not mind a seam showing and want the whole border the same colour. 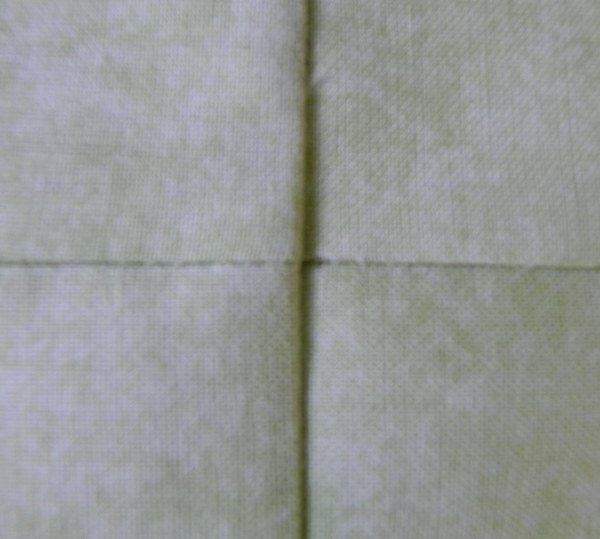 If this is the case I would recommend that you cut the border strips so that the join is in the middle or, if you are trying to save fabric, cut in such a way that the seam is in roughly the same place on each edge. In other words, make it look as if it is part of the design, not that the piece of fabric wasn’t long enough. Little things like that make it look as if you know what you are doing. Although it is simple it is the sort of thing that doesn’t occur to you until it is too late. Another way of doing this is to make a diagonal seam. 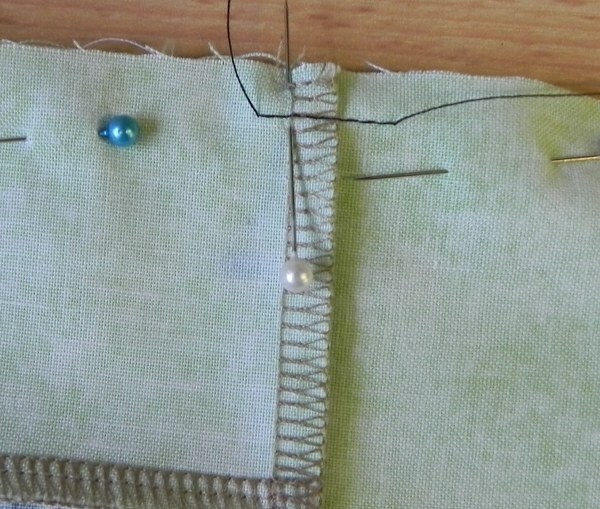 Place the strips of border fabric at rightangles to each other and pin or draw an accurate line from corner to corner. The line MUST go into the corners to make sure your border pieces are level. Voila! A nice neat diagonal seam. If you choose matching bits of fabric it will be almost invisible. Thinking outside the box you could get rid of the problem altogether by using fabric from the quilt to cut small squares and make a scrappy border instead. The quilt sandwich for quilting and the finishing binding are not difficult to understand from any quilting book. 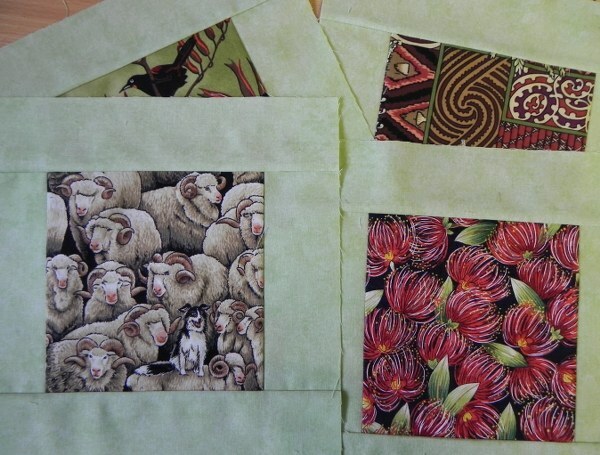 I will cover them when I come to do this quilt but meanwhile there are lots of sources out there if you are in a hurry. Hopefully we now have lots of machine applique experts out there. Just practice and you will get there. Just in case you were wondering where I have been – the answer is ‘down a rabbit hole’. 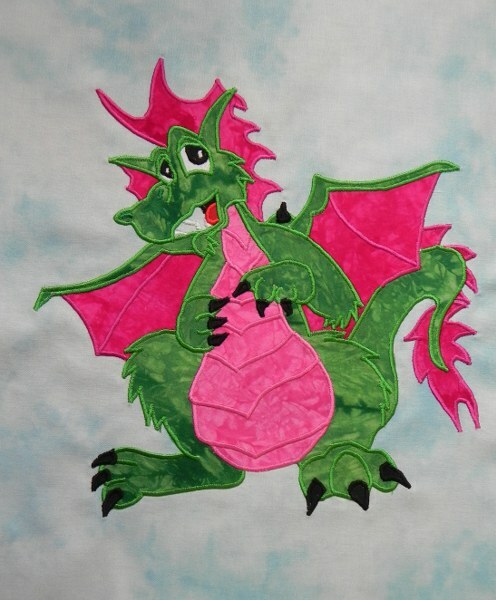 I have had to take a temporary rest from appliqueing dragons to venture into Wonderland. Sunday was Daughter Number one’s unbirthday, her birthday being the following Tuesday. 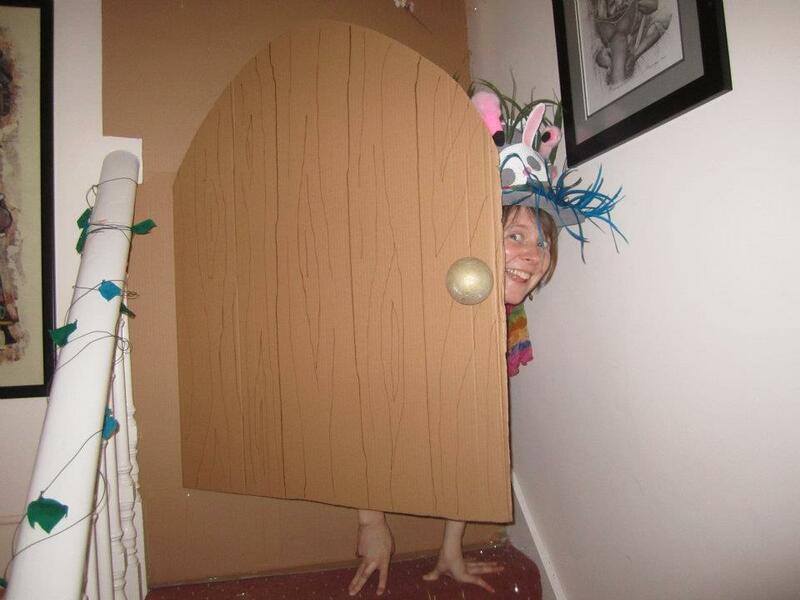 She has a penchant for themed parties and this year decided on Alice in Wonderland. This meant I had to find some sort of costume. 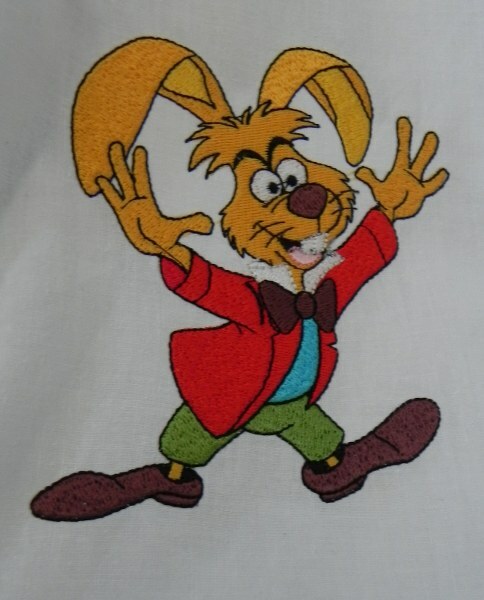 I suddenly remembered that amongst the embroideries I bought from The Quiltery last week was a collection from Alice in Wonderland so I found myself a shirt and off I went. I obviously had to have Alice. Followed by the other characters. 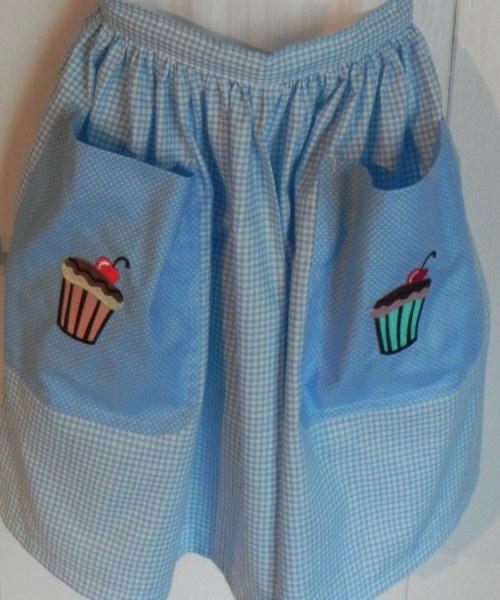 Pinny for Daughter Number 2 to serve the tea. 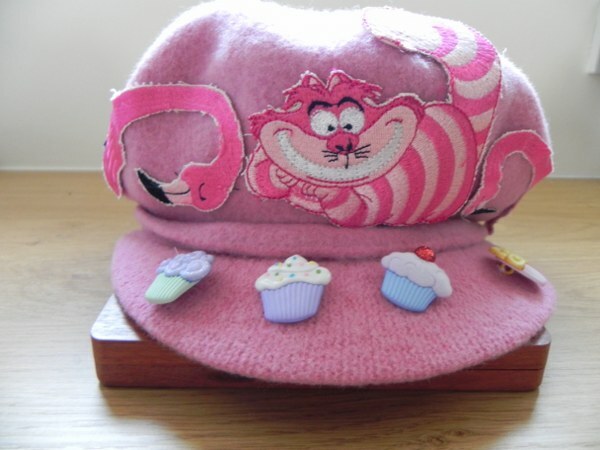 Everybody had to wear Alice in Wonderland themed outfits or a ‘Mad’ hat. We had to enter into the garden through the tiny door. This was a bit of a challenge to some of the people in tall hats as was the pea netting hanging from the ceiling. This was covered in crepe paper leaves, the window was open and every time there was a breeze it was like Autumn as the leaves floated down through the gaps between the lengths of netting. Quite an accidental plus actually. There was lots of tea and cake and fun was had by all. I haven’t been able to do any sewing this week. 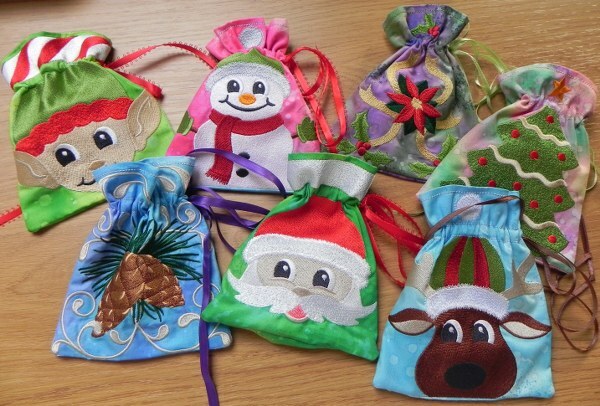 Yesterday Daughter Number One and I made little embroidered bags for Christmas goodies. They turned out very well. They are done completely in the hoop which means no finishing although there is a bit of temporary glue involved that created a few amusing moments. I sat on the top of the desk, turned round and tumbled everything to the floor. It appears I had sat on the paper we were using under the glue spraying activity, it stuck to me and as I moved it moved with me taking everything with it. It’s frightening how close Christmas is actually. These bring it home. Meanwhile back to the sewing. 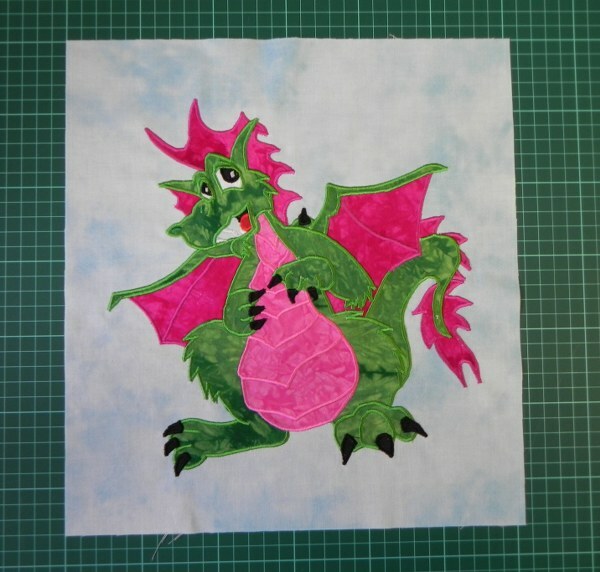 Here are the latest dragons on the way to completing my quilt. I gave in to my urge to buy coloured underthread so I will keep you posted on whether it is worth the extra or not. 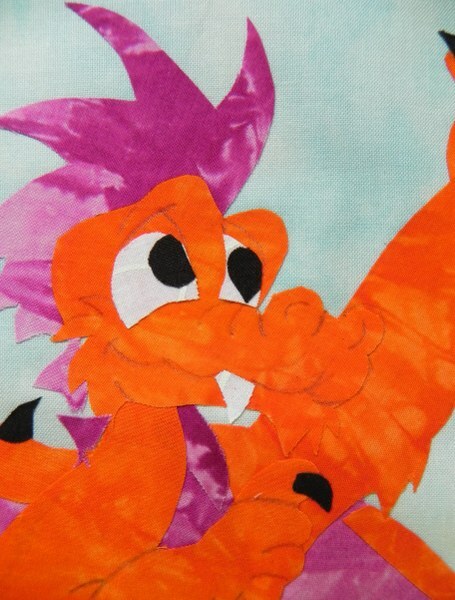 When I have finished the dragons I will take you through the next few stages of finishing a successful applique. 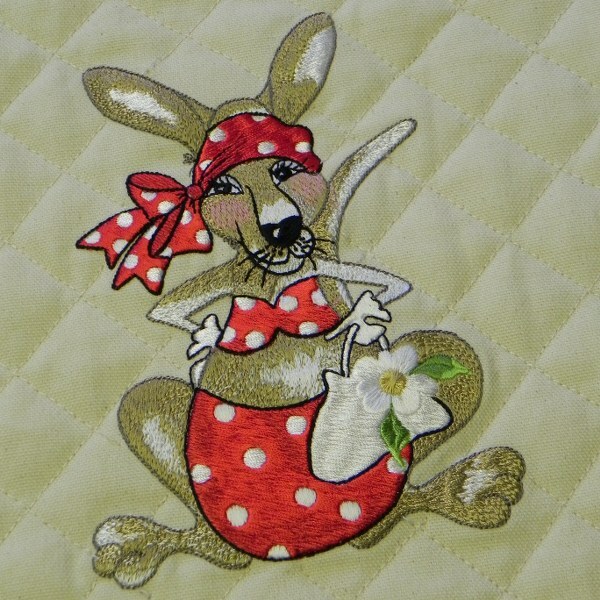 It is a waste doing a perfect applique if you don’t finish it off and insert it into the quilt top properly. However, this will be a lot easier with photographs so I will comment as I do it myself. I am still wandering through the land of dragons making cute little critters out of scraps and thread. Wouldn’t the Hobbits be surprised. I think St George might be a bit miffed too but that’s another tale for a winter’s evening. Remember I am narrating my way of doing things and the things that work for me. If you find another way, by all means take it. Take advice from wherever you find it, mix it up and pick out the bits you like best. It sounds like a bag of pick-and-mix but you get the idea. If you prefer the licquorice torpedos to the sherbet dabs, go for it. 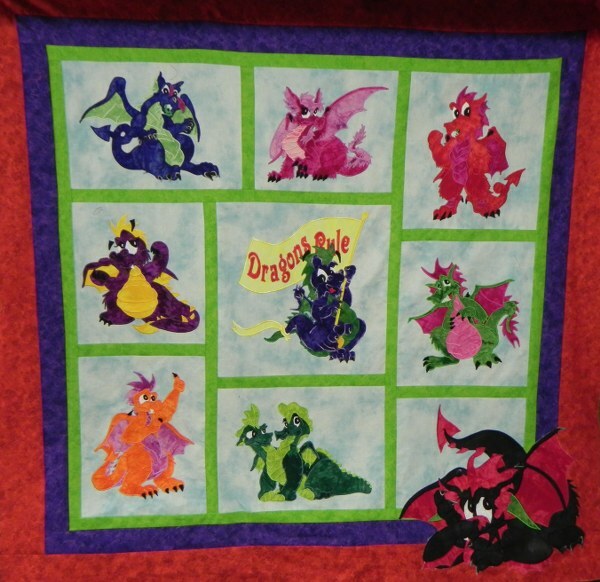 I gave you an overview of the beginning of the making of the dragon quilt in my last post. If this is the first one you are reading you might want to have a look at that one too to fill in the gaps. I discussed the basics of fusible web application and we ended up with templates covered with layered up fabrics ready to stitch. This time I will deal with the stitching a bit more. I always use machine embroidery thread for my applique and I always use satin stitch these days. I did toy with other embroidery stitches but was too afraid of how they would survive washing . 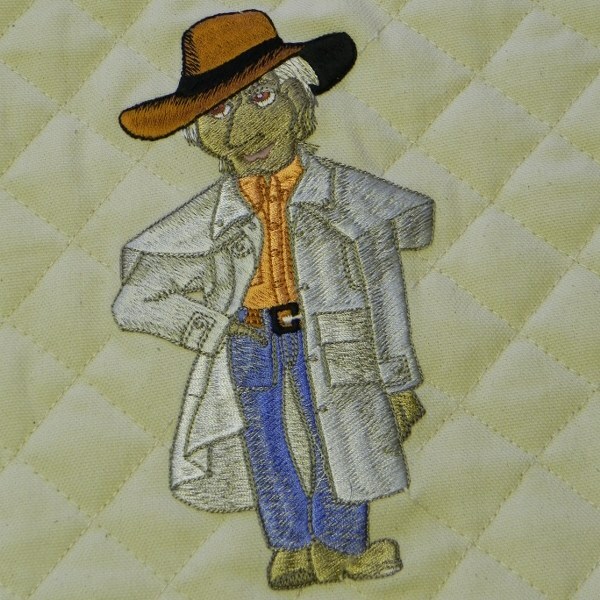 I always use the machine as have neither the skill nor the patience to do hand applique. I also prefer the satin stitch look but that is subjective. For every person who likes machine stitching there will be one who prefers hand stitching and ultimately neither is better than the other, they are just different. 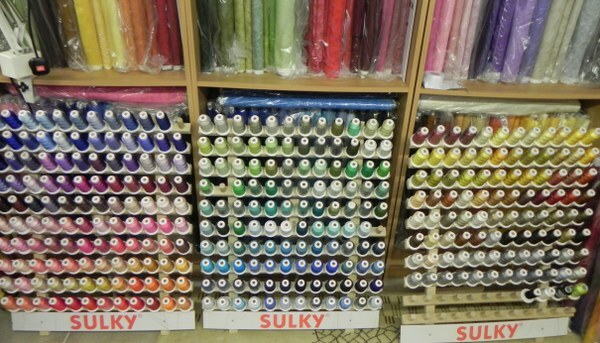 I have both Madeira and Gutermann Sulky threads, I use the Madeira for my embroidery machine as a lot of commercial embroidery patterns are done in Madeira so it makes life easier. Before I bought the Madeira threads I had already treated myself to the full range of Sulky threads and so I use them for the applique, to use them up so to speak. Unless you do a lot of embroidery you may not be able to justify investing in the large cops but the Sulky collection of all plain 40 weight rayon plus some variegated are available in purpose made boxes for a reasonable price. If you are in UK follow this link to buy either the large cops or collection of small spools at trade prices. These are prices without VAT so you will need to add that. 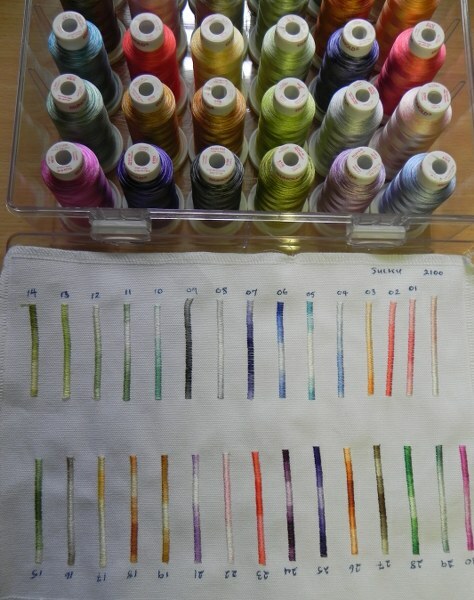 I have the variegated threads too and I have a little trick to help me see which is the nearest match to the fabric I have used. I stitch out a sample of each to keep in the box. Easiest way to identify the nearest match. Looking at the colour on the cop doesn’t help as different threads are variegated differently. Some blend gradually and some are almost stripes and only seeing them stitched will show you how they will look on your project.See some of the ones with more distinct differences below. The same applies to variegated metallics which are very handy for Christmas projects. It is not compulsory but I always use a piece of stabiliser under the appliqued block. This seems to help the machine sew better and more evenly. 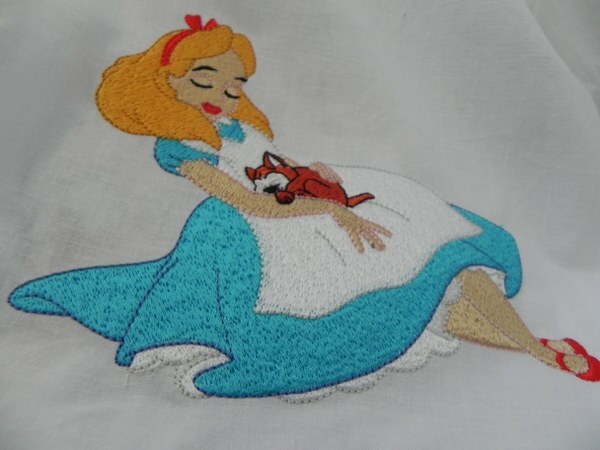 After all most people would use stabiliser if doing a standard embroidery on their machine and this is in effect embroidery. Any weight will do but if it is very thin use a double layer. As I keep emphasising, experiment. 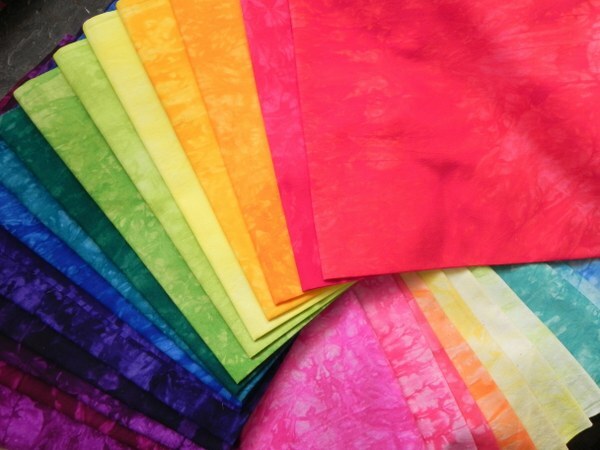 Try everything out on a sample of fabric with the same conditions as the project will have and only go to your actual project when you are happy with the result. A little preparation time can save a lot of unpicking and frustration. Stabiliser in case you don't know what it looks like. 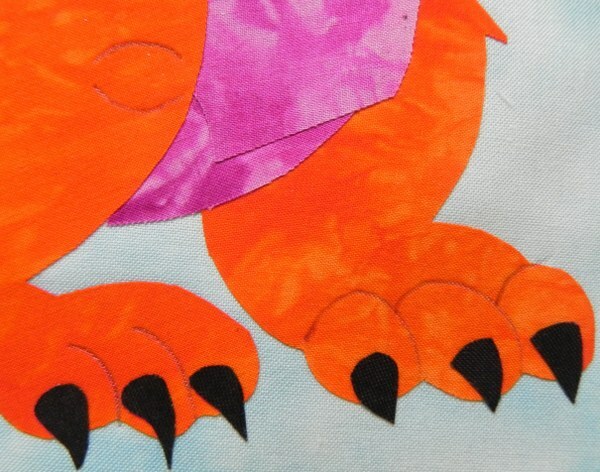 I also use an open-toed applique foot as it makes it easier to see the stitches and get them in the right place. It should be possible to get one to fit your machine. It certainly takes the aggravation out of a large part of the process. Your templated block on its own is not usable, it needs some definition. First of all I compare the block with the template and draw in any definition lines to help with the stitching. I also draw round any areas which overlap in an identical colour so that I can see where to stitch the outline. As I suggested in the last blog use bobbin thread on the bobbin. 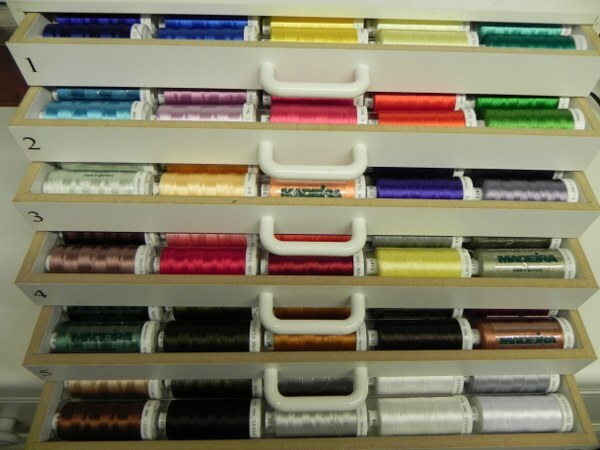 It is a finer thread than normal sewing or embroidery thread, the machine seems to prefer it and there is not so much bulk under the embroidery. Satin stitch is a fairly dense stitch and so there are quite a few threads to the square inch. If there is too much bulk sometimes the machine will jam and refuse to move. I can tell you from experience this is a pain and you really don’t want the hassle. As an added bonus the thread is cheaper and, of course saves your normal thread for when it is really needed. The next point is to loosen the top tension to around 3. Again experiment until you have a good even stitch on top with none of the bobbin thread being pulled through. 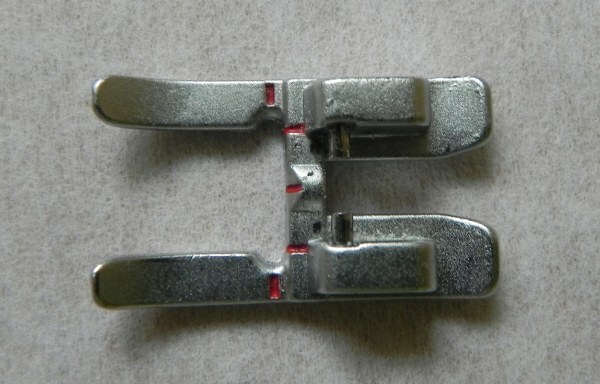 The other way is to tighten the bobbin tension but the top is the easiest and the result the same. The object is to make sure that the bobbin thread pulls the top thread down slightly so that no bobbin thread shows on the top and only a thin line of the top thread shows underneath. 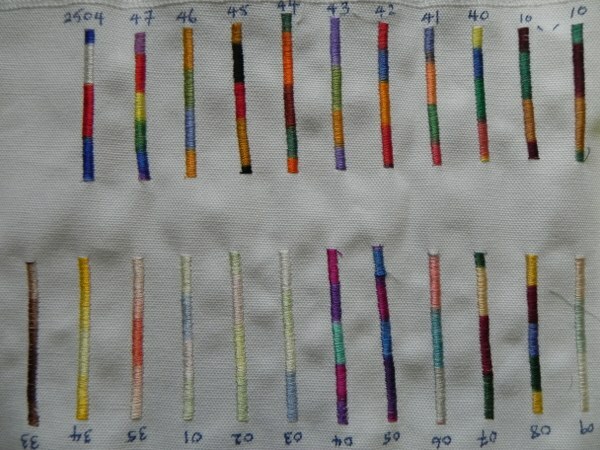 This will give a neat stitch showing only the colour you want to show. For general stitching round the shapes I set my stitch width to 2.5 on my machine. To do the definition stitching I lower this to 2.0. I think these are fairly standard on most machines but, again, experiment. You might prefer a wider stitch over all or some sections. Whatever you choose make sure that it is wide enough to enclose the raw edges of the fabric. 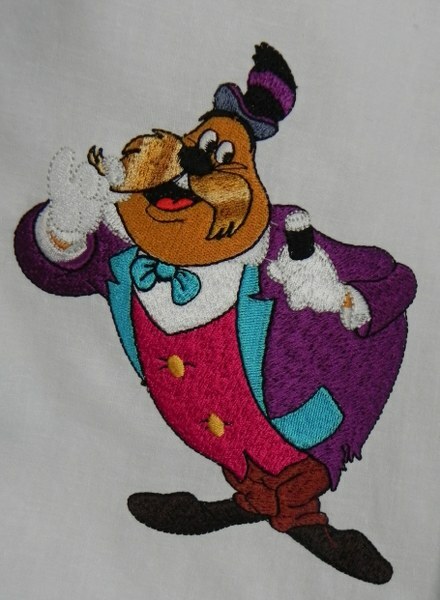 the stitches should just go on to the background with most of the stitch on the applique so that it doesn’t fray. 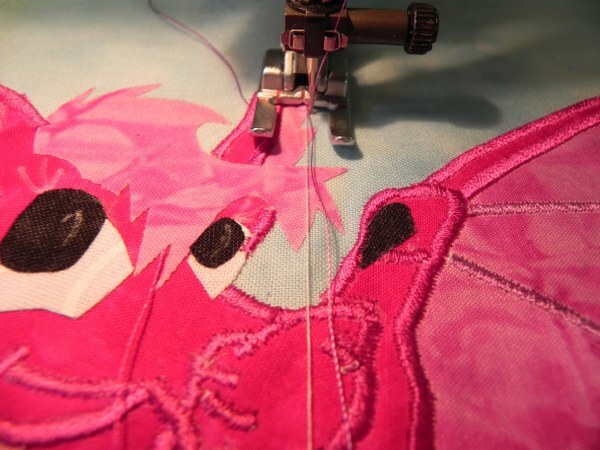 Even if you use a tying off stitch at the end of your satin stitch row it may pull loose if not finished off properly. I start my row with the both threads in front of the foot so that they will be covered by the stitching as I sew. One turn of the wheel by hand will raise the bobbin thread to the top, then turn it a couple of times before putting your foot on the pedal. That takes care of the beginning. Pull the two threads to the top under the foot. The secret to securing the end threads lies partly in the order in which the pieces of the design are stitched. Always look at your design and decide which pieces are underneath and which on top. Do the underneath ones first so that when you do the top ones you can make sure any loose tails are sewn into the stitching. It may require an extra colour change or two but which is more important, doing one colour all the way through without changing the thread or a better appearance and no loose threads? I would say that the finished article is the important thing, not the speed of sewing. Any threads that cannot be tied off in this way need to be pulled through to the back and tied off by hand with a few double knots. A short time working this out at the beginning saves a lot of unpicking. Well I have four more to do so I really must get down to the dungeon. The Big Cheese has gone to a sugar conference (how sweet) so I don’t even have to stop to eat today. 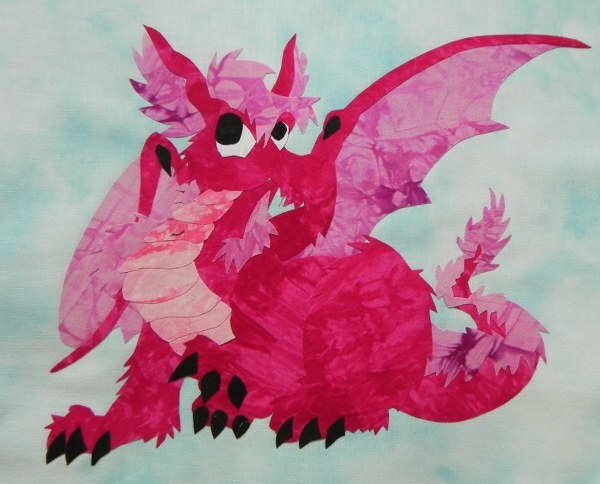 Hopefully I have helped at least one person on the way to applique. I have tried to make it understandable which is not always easy when you know what you are doing. It is easy to forget when you knew nothing and assume knowledge by the other person. (Have you read a computer manual recently) If you need any clarification send me a message. Otherwise happy appliqueing until next time. 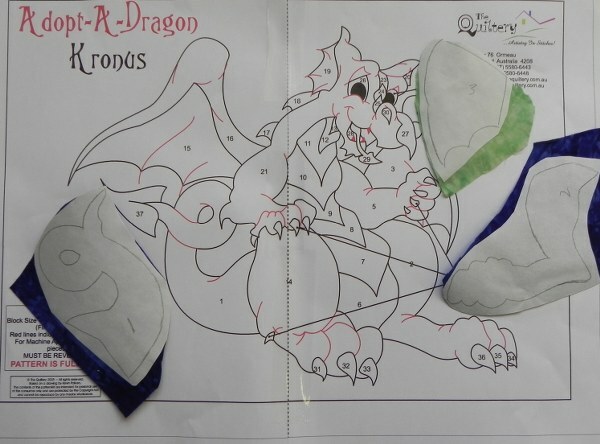 I was in my dungeon piecing dragons – as you do , and I felt another tip coming on. 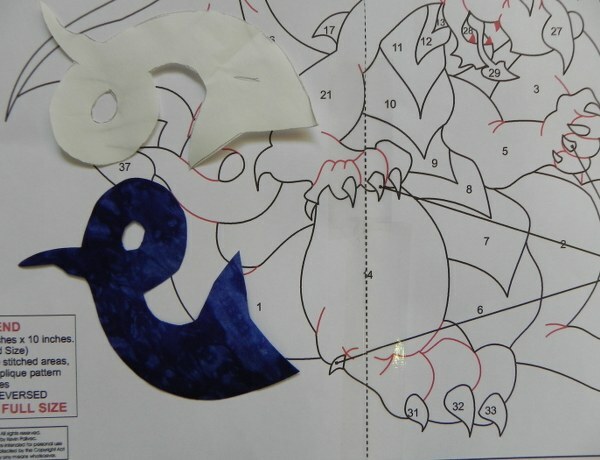 This time it is a bit of a visual on how to piece fusible web appliques. The theory is very easy if the practice can be a bit fiddly. There are so many wonderful appliques out there and it seems a shame that more people don’t do them. I, for instance have looked longingly at several Mckenna Ryan’s reckoning they would be so fiddly that, even with my experience they would be the cause of a nervous breakdown. My problem is that ‘art quilt’ or not, I cannot see myself doing anything less than satin stitch applique round all the shapes. Anyway, I have finally invested in one and I will keep you posted. A quick look through certainly doesn’t show anything that would be too daunting so we will see. 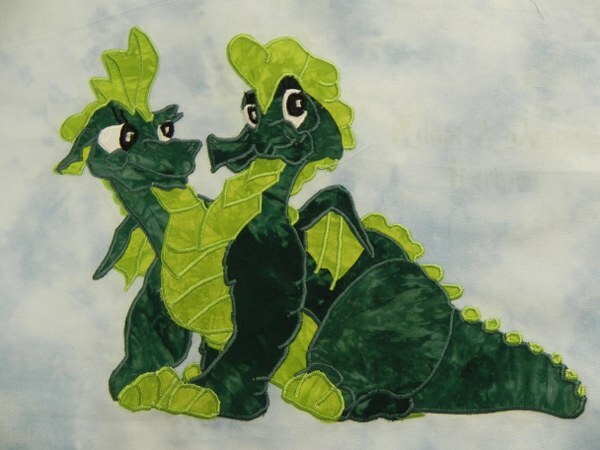 Isn’t that just the cutest set of dragons you have ever seen. 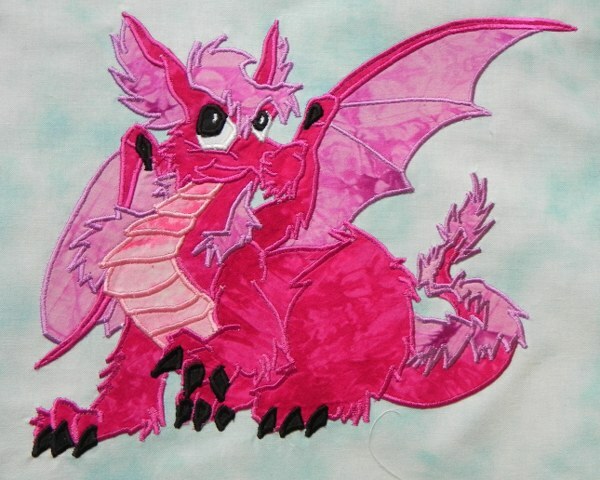 (If dragons can be cute) I have stitched one and laid out a few others ready to stitch. I wouldn’t recommend it as your first attempt at applique unless you are blessed with a very large measure of patience and perserverance. 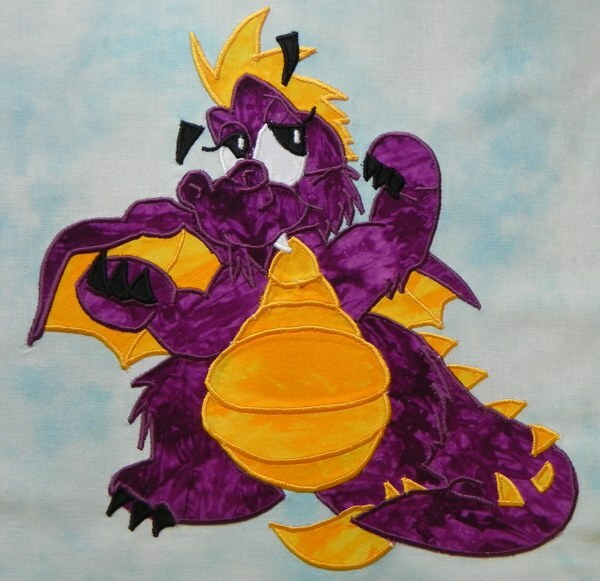 However, the different stages of putting together these appliques are the same as those for simpler ones. The patterns are well presented except that the pattern pieces need to be retraced as they are not supplied in reverse. 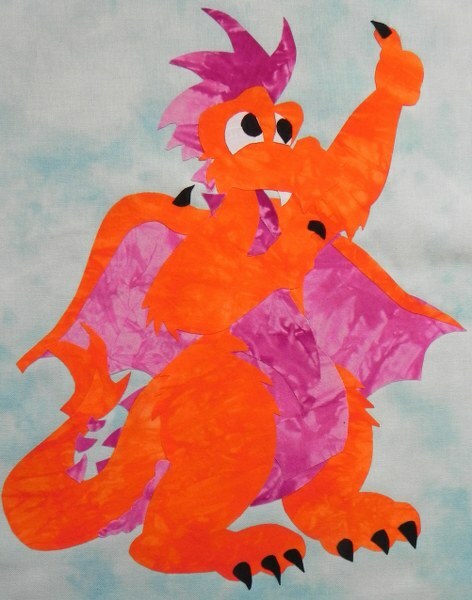 I would say that there is no way anybody could do these dragons with anything but fusible web applique so the patterns should really have been supplied reversed . 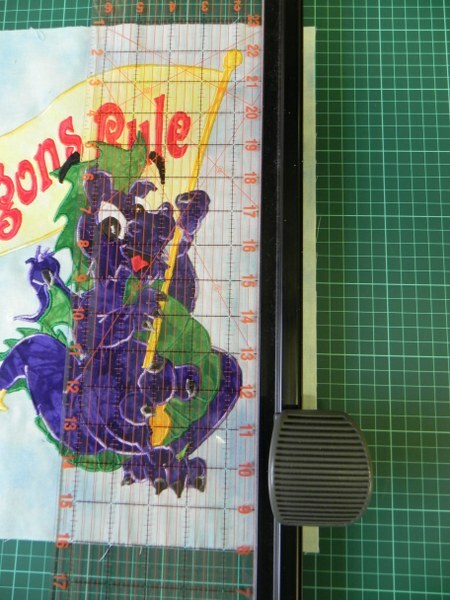 However, if you have a photocopier that does mirror image copying you can use that or just trace the pieces onto the back of the pattern sheet with a light box. The reason for needing reversed pieces will become clear as the lesson progresses. 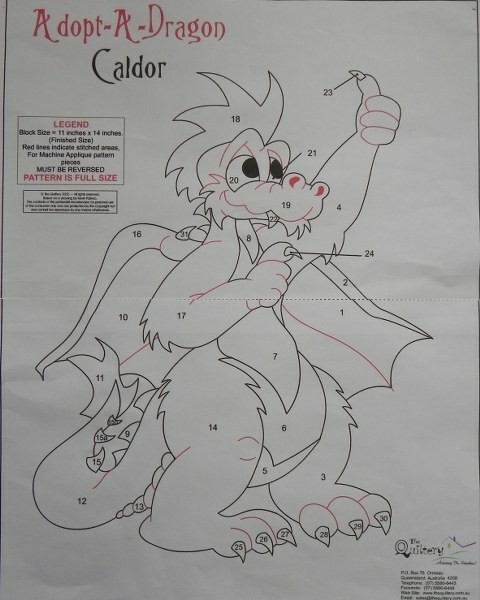 Each individual pattern comes with a pattern sheet. As I said at the beginning the pieces need to be reversed so they need to be traced through the pattern sheet onto the back. Compare this picture with the pattern sheet above to see what I mean. A light box helps at this stage. I have seen people use a window but that requires more sun than I ever get in my dungeon. If you have good eyesight you might manage without. 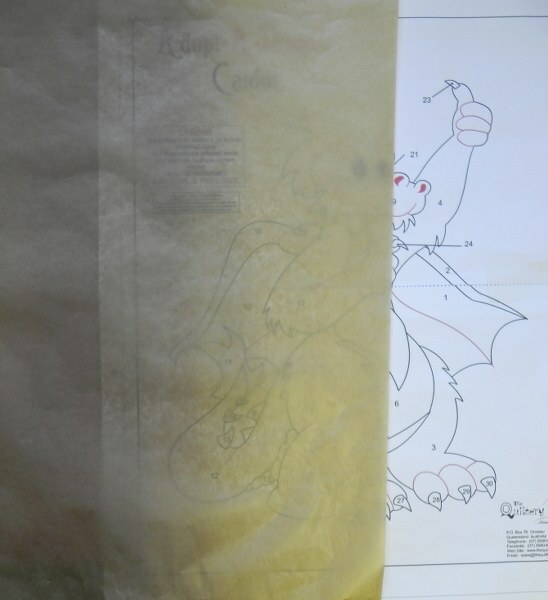 Pattern pieces traced onto the back of the pattern sheet to reverse. 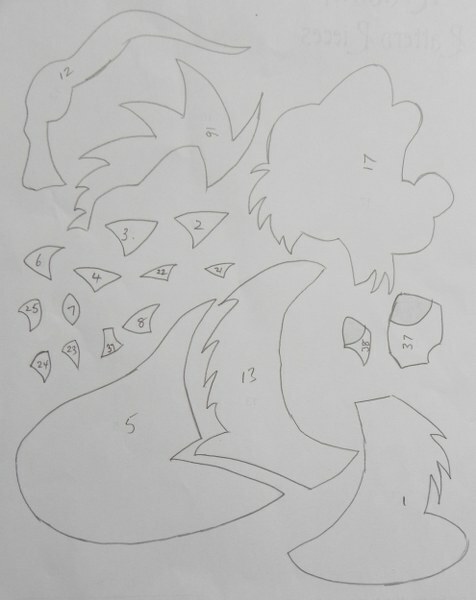 These pieces now have to be traced onto the paper side of a sheet of fusible web sold under various names in various countries. It is basically a piece of paper with glue fused onto it. Pieces traced onto fusible web. 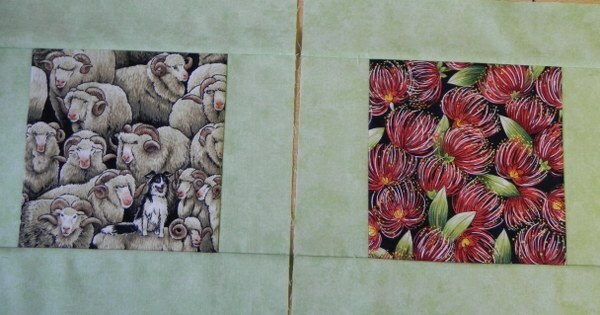 This is my choice of fabrics for this quilt. They are available from Starr fabrics in the wonderfully named Pig Alley in Etna CA. These pieces are now roughly cut out and ironed rough (glue) side down onto the WRONG side of the fabric to be used. Pieces ironed onto WRONG side of fabric. Each piece is then cut out on the drawn line and the paper removed, leaving a piece of fabric in the right shape with glue on the back. Cut out and remove paper. The next stage requires either a piece of non-wax baking paper (greaseproof in UK) or an applique sheet. 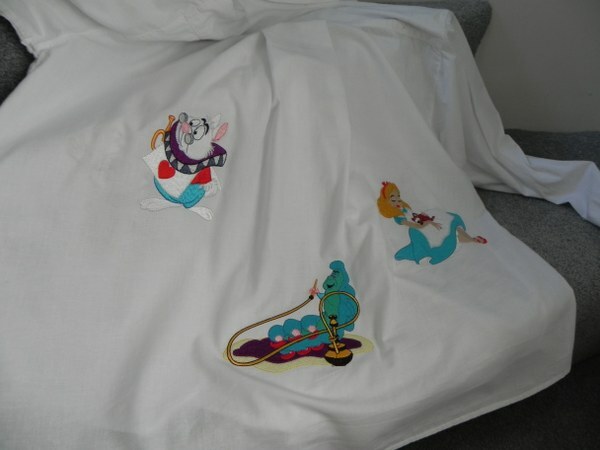 I prefer the former, I don’t get on with the applique sheets very well. 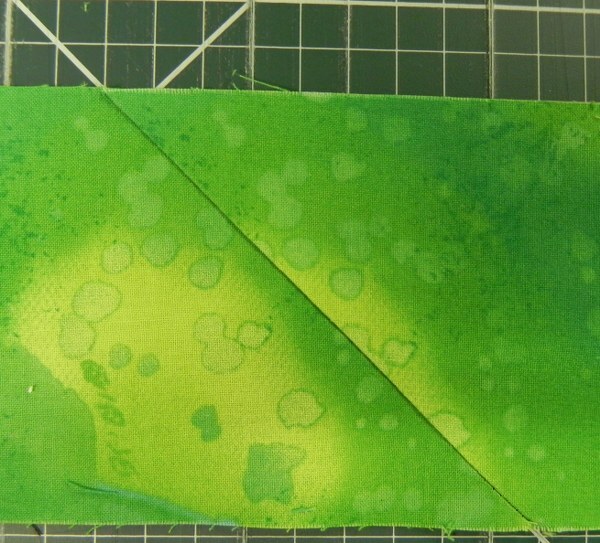 Lay the paper or applique sheet over the layout page. Lay the greaseproof completely over the layout. The layout should be completely covered. This picture is just so that you can see what I mean. All the pieces are numbered. In this pattern they go onto the sheet in the order they are numbered. 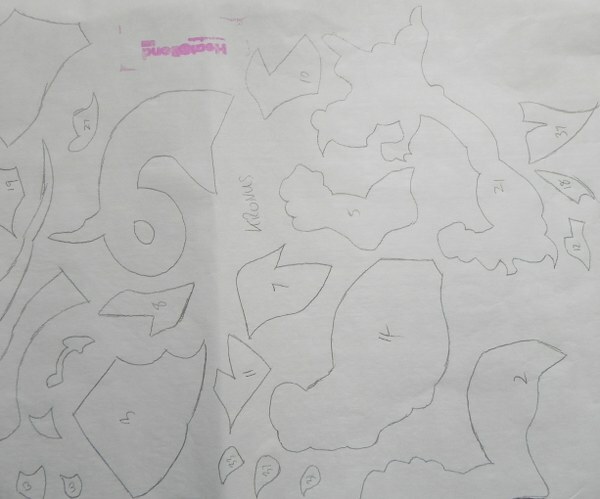 If you look at the picture where the shapes are ironed on to the fabric you will see numbers on the pattern pieces. Place them on the corresponding numbers on the layout. Tack them down with the point of the iron. When you are completely happy with the layout iron over the whole lot quickly with steam (or follow the instructions on your brand of fusible webbing). When cool remove the whole applique from the greaseproof paper. Take the piece of background fabric in the size specified in the pattern. Lay the applique onto the background at the angle you prefer and, using a steam iron, press onto the background to fuse permanently. 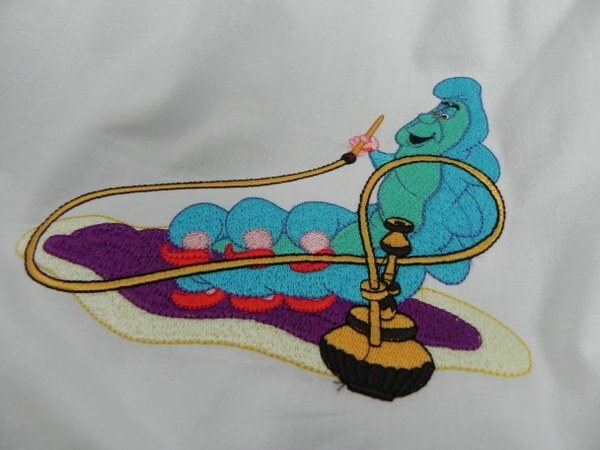 As you can see this is not acceptable as an applique. It needs stitching. 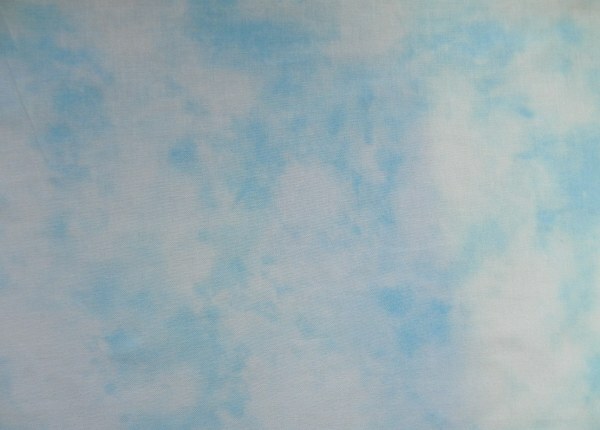 This particular pattern is suposed to be satin stitched. Satin stitch is just a close zigzag stitch with a very short stitch length and about 2.5 wide. Test on a spare piece of fabric to make sure it looks good. Lower the upper tension to around 3 – again experiment until no bobbin thread shows on top but the top stitches are not too loose. Use a special bobbin thread. This will help the machine move more easily and also save your more expensive thread. 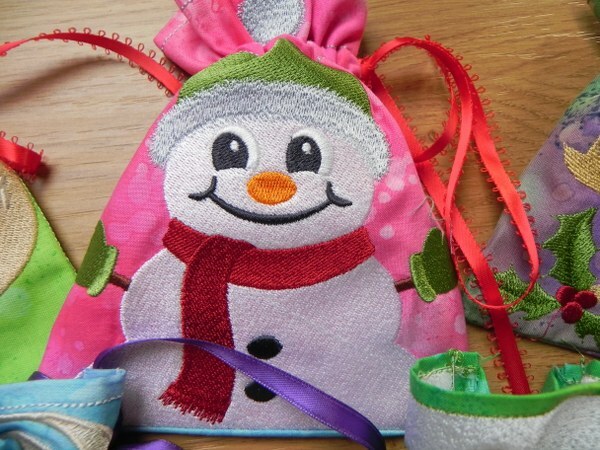 I use a piece of embroidery stabiliser under the whole applique shape. This is not obligatory but makes life much easier. See which pieces go over and under others. Try to do the underneath ones first so that as you sew the next layer the bottom start and end stitches are caught in so they do not come undone. Here is one I prepared earlier. As you can see the stitching makes all the difference. I use matching embroidery threads. You could experiment with anything. 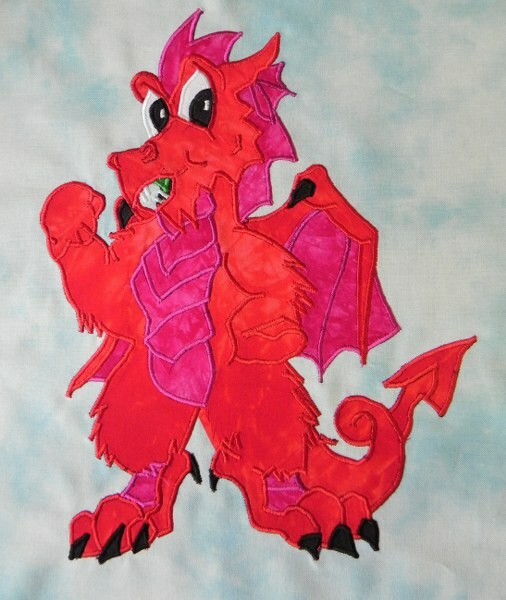 If you want to try out some applique without buying a pattern in case you don’t like it, use a colouring book. Trace the shapes as above, perhaps starting with something simple, and see if you like it. I personally have great fun doing this sort of quilt. it gives a sense of achievement. 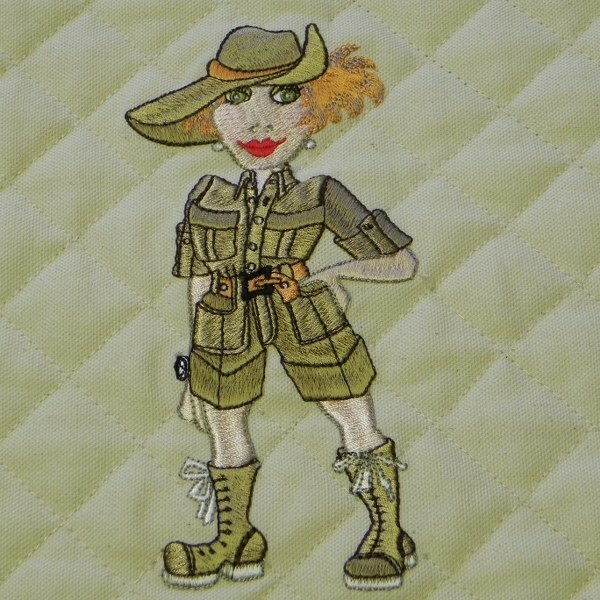 There is a link to the web site above or go to http://thequiltery.com.au and click on ‘pattern club’ there you can have a look at the patterns available before you join. I’ll post a picture of the quilt when I have finished it. 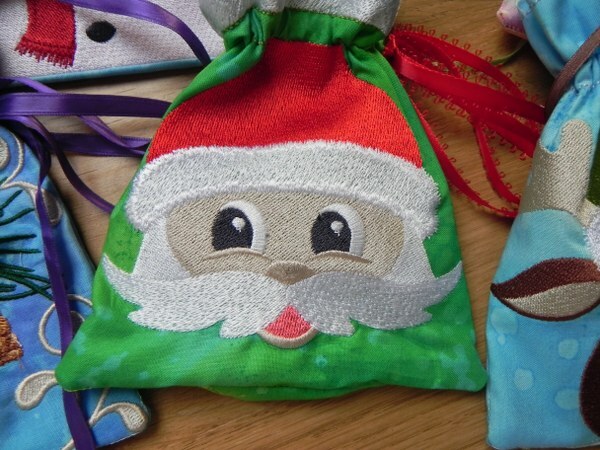 I hope this little tutorial gets somebody on the road to satin stitch applique. It really is rewarding. A couple of years ago on the way back from an overseas assignment the Big Cheese and myself did a tour round New Zealand’s South Island. Not being a slouch when it comes to sniffing out a quilt shop I did just that and bought some local fabrics to make into a memory quilt. I was making this and thinking about how I learned to do various techniques when I realised that there might be people out there who could benefit from a few things I learned along the way. Experienced stitchers may want to go off and do something quilty at this point as they might otherwise get bored. I decided to do a simple showcase quilt as the fabrics all feature something that says ‘New Zealand’ to the viewer and chopping them up would spoil that feature. 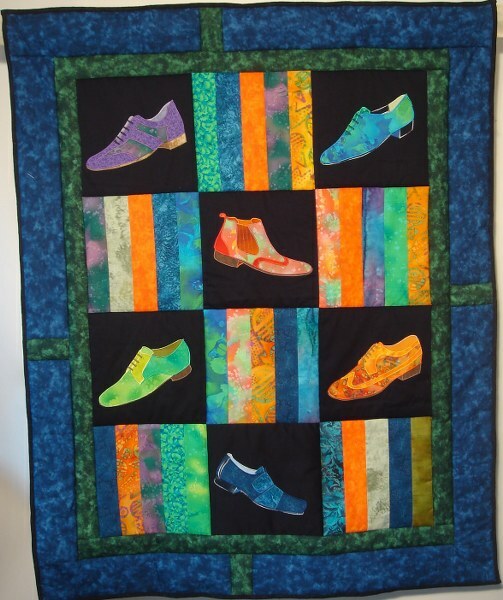 The whole point about a showcase quilt is that it tends to frame the fabrics a bit like a picture. This in turn means that as the quilt comes together seams have to be matched. In this particular piece I gave myself extra grief by having whole rows with seams that had to be matched. I did not despair, however as I have a technique for just this problem. Framed squares ready for joining. Two framed squares lined up ready to be joined. If my squares do not have to sit in one direction I often turn them 90 degrees so that the seams are not actually right next to each other. Here is an example. If you look closely you can see the seams in different directions on the borders. Then you only have to worry about the seams between the blocks. The best way to make sure your seams line up is to pin them very carefully. Look at both sides as you do this and put a pin at rightangles when you are sure the two seams line up. 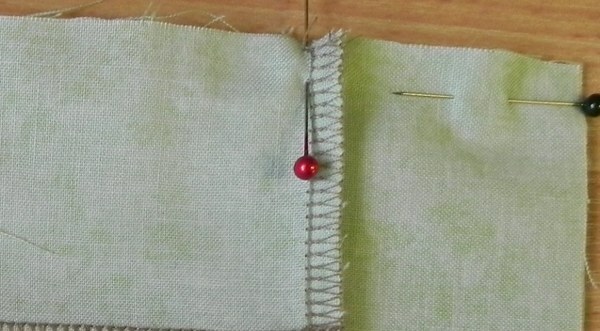 If you use an ordinary sewing machine to stitch your seams leave the pin in until you have finished sewing over that point. If you have it at rightangles your needle should go over it. I make life more difficult for myself by overlocking all my seams as I find they are stronger and don’t come undone as some did in my very early experience of quilting. I sew a short length on my normal machine first to keep the seams aligned when I come to use the overlocker. Once stitched this gives several rows of joined squares that then have to be stitched into a whole top. The same applies again with the seams. Line up, pin and stitch. Then the joins should look like this. The photo is a bit blurry but you get the picture. With this technique a bit of patience and a deal of concentration your seams should line up beautifully.